Osseointegration Implants Market size value exceeded USD 4.6 billion in 2016 and is projected witness over 7% CAGR from 2017-2024. Growing geriatric population, rising number of trauma incidents, and escalating disposable income levels will be the most impact rendering factors driving osseointegration implants market size over the forecast years. Cosmetic dentistry has become an integral part of culture in North America and Latin America and its gaining popularity in other regions. Osseointegration implants are the essential part of cosmetic dentistry revolution. Rising number of partially or fully edentulous people will spur demand for these implantable devices. Prosthetics installed by osseointegration provide several advantages over conventional options as they are built with fewer components, simple frame design, lightweight feel, and greater comfort. They also provide better control, extension, and suspension to perform normal daily activities such as working out and walking down a flight of stairs. Dental implants held significant osseointegration implants market share in 2016. Ongoing R&D on dental implant techniques, designs and materials has improved in recent years. Advancements are done in the use of improved surface modification implant design, and biomaterials, to improve the long-term outcomes of the treatment. Bone anchored prosthesis is bolstered by an increase in consumer base of amputees and technological advancements. Rising FDA approvals for certain products will stimulate osseointegration implants market growth over the forecast years. Zirconia held largest revenue share in 2016. Zirconia is an appropriate dental implant material owing to its toothlike mechanical properties, colour, and hence biocompatibility. Apical gingival recession and bone loss associated with implants are observed to uncover portions of the metal implant, revealing a bluish staining of the overlying gingiva. The usage of zirconia implants evades this impediment and complies to the demand of numerous patients for metal-free implantations. 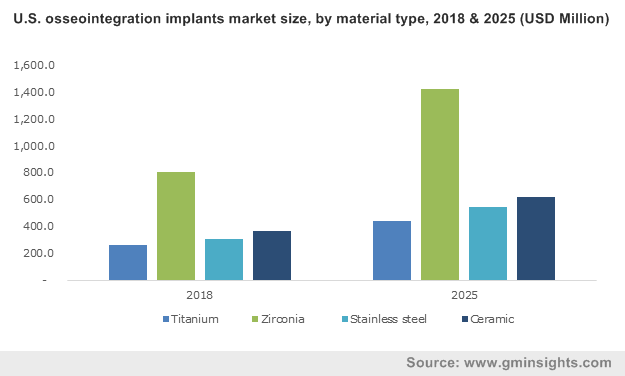 Titanium implants will witness significant growth over the forecast years. The binding ability of titanium implants promotes healing. It is also highly compatible with the body tissues. Their widely usage in bone anchored prosthesis will boost the osseointegration implants market growth. Dental clinics is preferred choice for dental implant procedures owing to cost advantage over hospitals and ambulatory surgical centres. Availability of full-time dentists and required dental infrastructure will fuel segment growth over the forecast period. Hospitals will play a significant role in bone anchored prosthesis surgeries over the coming years. Rapid approvals of prosthetic devices and growing awareness among patients will propel osseointegration implants market growth. U.S. osteointegration implants market held the largest market share in 2016 owing to increasing geriatric population, rising incidence of bone related disorders and favourable reimbursement scenario. Germany osseointegration implants market held the largest regional revenue share followed by Italy. Developed healthcare infrastructure and increasing awareness will drive industry growth. Increasing number of approvals and presence of prominent industry players in this region will fuel business growth. China osseointegration implants market held significant regional revenue share in 2016. High population, rising disposable income levels coupled with favourable government initiatives will drive regional market growth over the forecast period. 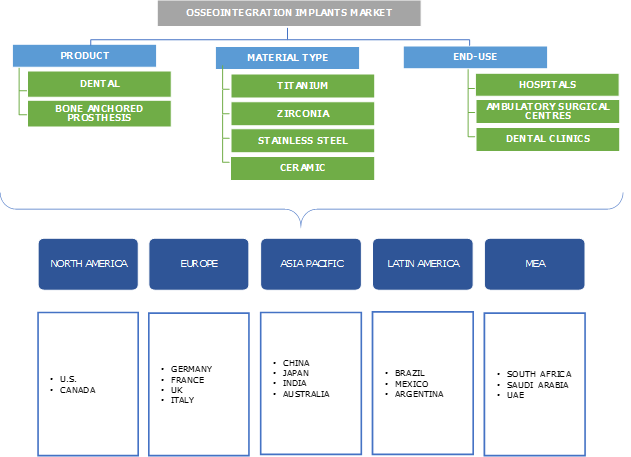 Some of the major players in Global Osseointegration Implants Market are Zimmer Biomet Holdings, Dentsply Sirona, Bicon, Institut Straumann, Danaher Corporation, Camlog Implant Systems, Osstem Implant Co, and Integrum. Product innovations and collaborations with domestic companies are chief strategies of established companies operating in this market. For instance, on April 12, 2017 Zimmer Biomet Dental Announced new partnership with NovaBone products for circulation of NovaBone Dental Morsel Devices & Putty. This move is likely to help the company strengthen its distribution network. Bone anchored prosthetic implants are relatively new compared dental implants. Only few companies offer bone implants in the market on the other hand there are many companies in the market that provide dental implants for various requirements of the patients. Bone anchored implants are poised to traction over the forecast period owing to the rising development of quality of materials use, need for better option apart from socket prosthesis.